Teachers attend Machinima Monday at the Montmarte Theatre in Second LIfe. 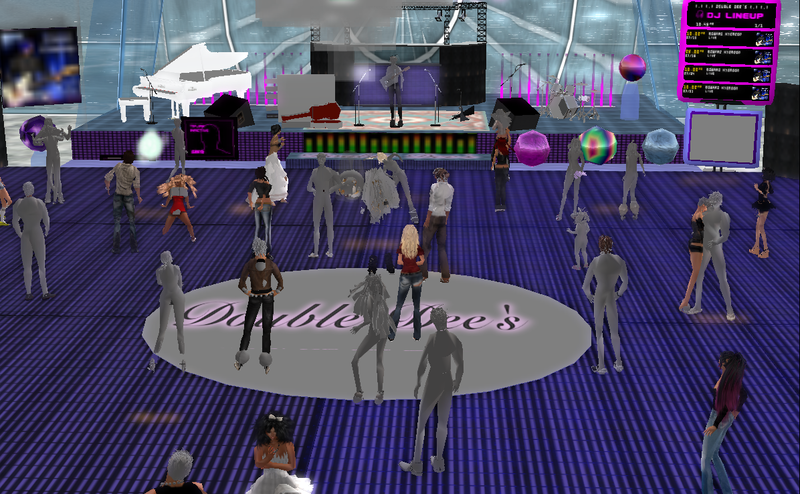 The second week of the 4-week VWBPE Games and Education Tour MOOC had a Machinima focus. What fun to watch and participate with fellow educators as they crammed an incredible amount of energy, curiosity, intellect, humor and talent into developing machinima to help us all learn to do it better and to help our students with machinima as a learning strategy. The word that kept cropping up was FUN…and fun it was, sometimes funNY. The week started with a Second Life Machinima Monday meeting with non-educators, an introduction to some machinima created by artists using this medium to relay emotions and ideas. There was much discussion on technical issues…aspect ratio, capture tools, in world camera devices, editing software, special effects, space navigators to name a few. Always a benefit to get a different perspective. Our Hostess, the gracious and talented Chantal Harvey facilitated the conversation and welcomed teachers to join the digital artisan group. Discussing a possible script with an alien avatar – the alien ended up in the movie Sand Surf Saloon. The remainder of the week consisted of working groups, and some individual work on machinima with the of using the medium for teaching and learning. The MOOC participants were all comfortable in virtual environments and some, though not all, had significant comfort with creating machinima. The week was an opportunity for educators to work together on a machinima project and reflect on the potential use with students and in delivery of instruction. K-12 and higher education educators worked side-by-side, incorporating strategies, taking on a variety of roles (script development, actor, director, machinimatographer, builder, costume designer, sound editor, video editor, stunt actor, special effects editor), and collaborating to complete a project in less than 1 week. Attendees enjoy teacher created machinima at the Gaity Theatre on Second Life. The exercise served to help us understand what we can expect of your students and what skills our students will need and will develop as they participate in this kind of learning activity. 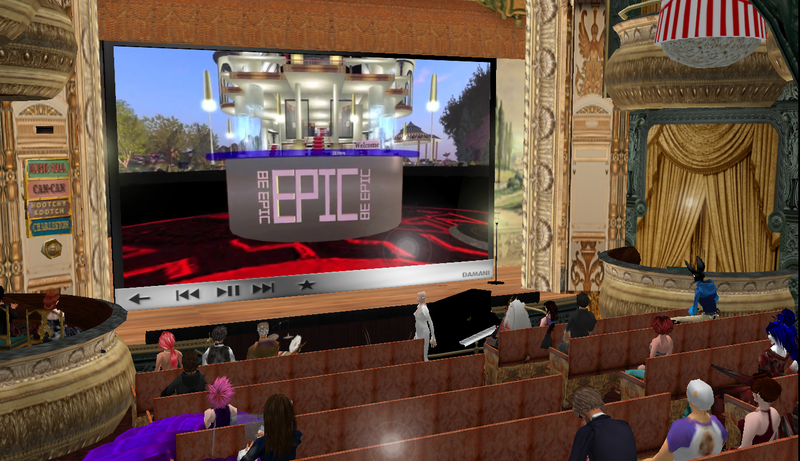 The culminating activity was a Premier held at the Gaity Theatre on Caledon in Second Life, a tour destination from week 1 of the MOOC. As the ISTE Conference this summer draws near, this talented group of machinima educators will continue to polish off their work and encourage colleagues and students to submit their digital creations to the ISTE EDUmachinma Fest. No doubt we will have entries form the growing number of virtual worlds and from a growing number of participants. As I walked down 6th street in Austin Texas recently, I was met with an array of live musical performances, with the exception of the 104 degree weather it was not unlike teleporting around the musical venues in a Virtual World. On multiple grids professional musicians, hobbyists, students, career changers and potentials all perform for an appreciative live audience. Setup in a virtual venue includes plugging equipment into a computer to provide a live stream and logging into a virtual environment. Virtual worlds offer easy to access venues so the novice band playing in a garage or the professional blues singer and guitarist in a practice room are able to logon and perform for a live audience from the comfort of their home or studio. Musicians even perform with colleagues from another geographic location, appearing together inworld. The Arts are experiencing cuts in education spending and students hoping to pursue a career in music, drama, or art related areas may need to access alternative arenas for exploring, practicing, and performing their talent and related skills. Accomplished musicians perform in virtual venues, across virtual grids all times of the day, every day. Perhaps “virtual performances” will become a mainstream outlet for entertainment, at the very least it is a potential learning ground for aspiring performers. In addition to performing, song-writing and employing technical tasks, aspiring musicians can practice skills necessary in the music business such as working with an agent and dealing with bookings, public relations, promotion, marketing, and even managing finances. As the mode that we access music is changing, so is the way we provide and access entertainment. real life performance as well as some unique qualities available only in a virtual world. A musician on Second Life told me it was more like being in a sound studio, missing are the auditory and visual cues that a real audience provides. In a virtual environment, you must ‘read’ your audience through chat. Setting up equipment so that you can see the computer screen while you perform allows a performer to be able to read the chat and thus respond to audience cues. Typically the audience will respond with applause and commentary, the commentary does not disrupt the performance and is typically a conversation about the performance (the lyrics, historical references, personal reflections). Another unique trait of entertaining an audience of avatars is that you can see all their names and additional ID tags providing the performer with a supply of information for personal interaction with the audience. Technical aspects of performing online require some hardware setup as well as software to enable audio streaming. A basic requirement is a high quality microphone and a quality sound card. Some software is available online for free and some have an associated cost. Setting up to a streaming server and entering IP addresses are part of the setup. Then of course the performing avatar must develop their stage presence including attire, hair, appropriate instruments and animations. The ability to create supernatural effects to enhance a performance brings an additional magic to a virtual show that could be cost prohibitive or simply impossible in the real world. A student who is interested in performance as a future career may be able to learn a great deal by performing in a virtual setting. There are the technical and studio aspects as well as the “live” aspects. The virtual stage can provide a feeling of “being there” without some of the barriers of physicality and on stage jitters that often accompany new performers. In a recent LA Times article, Thriving Music Scene, a musician who regularly performs inworld, and makes money doing so, states that “…the interactive experience that the virtual platform provides can actually surpass that of traditional live gigs.” Perhaps this venue can provide a “training stage” to help prepare future performers, something for our performing arts instructors/schools to consider.